Olivia Cleans Green: WIWW: Vintage Victory and Chug-A-Lug Cheer! I'm celebrating! I won a Chug-A-Lug and I scored the most awesome vintage dress. Backstory: I won a Chug-A-Lug via a raffle I entered at the RISD Alumni & Student Art Sale. Gibb drove up to my house Ed McMahon style and hand delivered it to me! Chug-A-Lug is handmade in Warren, RI by The Makers Mill. 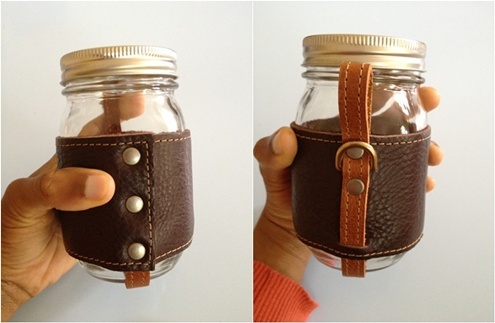 A Chug-A-Lug is a leather cozy that fits snuggly on a mason jar. It's designers, Gibb and Freyja, hope it will replace disposable to-go cups and plastic bottles. What has you feeling victorious and cheerful this week? Let me know in the comments. And did you enter my ENJO bathroom package giveaway yet? If you're visiting from WIWW, please say hi. Wow! how fun to have won something so unique and handmade! You look awesome, like you are always having a BALL!! I love your vintage dress! Thanks Shon! I was having a BALL! LOL! Hi Olivia! Cute cute outfit! I love your fun and enthusiasm in the photos. That cup holder is really cool too. A couple years ago I watched a great documentary called "No Impact Man" and I loved the idea of carrying around a jar to use as a cup/coffee cup. Also, thanks for visiting my blog! Thanks Mary! No Impact Man was great. So many good ideas there. Remember the scene where they washed all their clothes in the bathtub with their feet? That was awesome! Wow, that is quite a nice and practical prize, and I love your unique dress, too! That pattern looks so you! Lol LOVE it :) Hope to see you linked up at What I Wore Wednesday Just grab the badge or link and comment and you're good to go! Hi Melaina. Thanks :-) I linked up at The Pleated Poppy.